Louis XIV and his court inaugurated the Paris Observatory, construction of which had begun in 1667. As of 2018, it is the oldest astronomical observatory still in use. A chondrite-type meteorite exploded over Muskingum County, Ohio, near the town of New Concord, spreading fallen stones over several miles. Some sixty years later, reports started circulating a colt had been killed in the event. Construction began on the first "skyscraper," the ten story Home Insurance Building on the corner of LaSalle and Adams in Chicago, Illinois, generally acknowledged as the first steel-frame high-rise building. The first skyscraper was built in Chicago, Illinois, starting on 1 May 1884, and completed in 1885. The ten story Home Insurance Company building, designed by William Le Baron Jenney, had a steel frame (steel-girder construction) to carry the weight of the building. Its walls provided no support, but hung like curtains on the metal frame, a revolutionary construction method of American architecture which allowed architects to design and construct ever taller buildings. The term "skyscraper," which came into use shortly after it was built, originally applied to buildings between ten and twenty stories tall. By the late twentieth century, as such buildings became more common, the term was generally used only to describe high rise buildings of unusual height, and most often greater than 40-50 stories tall. The first skyscraper was demolished in 1931, replaced by a 43 story tower framed by four 22 story wings, the LaSalle National Bank Building. The newer edifice was the last major skyscraper built in Chicago before the Great Depression and World War II. Neptune's moon Nereid (the second known moon) was discovered by Gerard Kuiper. Goethe Link Observatory discovered asteroid #3428. 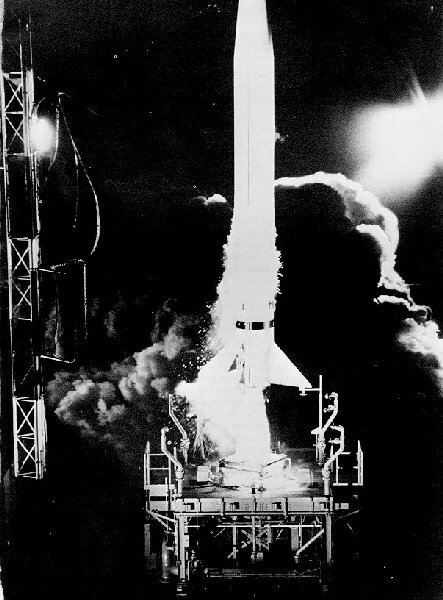 The Vanguard TV-1 booster test was launched and reached a 195 km (121 mile) altitude while traveling down range 726 km (451 miles). In the first test STS stack move, NASA's shuttle Enterprise (OV-101), external tank and solid rocket boosters were transported on the mobile launcher platform from the Vehicle Assembly Building to Launch Complex 39-A at the Kennedy Space Center. NASA's STS 100 (Endeavor) mission ended after delivering the Canadian robotic arm to the International Space Station.